Impelled to write about it: last Friday evening the new images in the windows of Bett Gallery Hobart lured me in at once for further investigation. ‘The joy of crafting’, or what might possibly be ‘the pain of crafting’, lies within the art of The Nature of Things. Michael Schlitz’s large format, relief woodblock prints not only require physical strength, manual dexterity and mental determination but relic traits such as artistic skill, knowledge, patience and time. These traits will never lose their value especially when the work is sympathetic and evocative with regard to the human condition and the condition of nature. Michael Schlitz has returned us to the ancient craft of the relief woodcut which was used in Egypt, Europe and Asia for mass production of textile printing, spreading the word of God and making of pictures, respectively. At once we see imagery that is real and imagined. Call it what you like; Surrealism, Dream Imagery even Magic Realism are all terms that could be applied to Schlitz’s pictorial imagery. As there is no accompanying text or artist’s statement, intentional or not, I certainly do not wish to insult the artist by my commentary. That the work speaks out ‘loud and clear’ is refreshing and fill me with wonder. The content herein presents a human creature that sometimes transmogrifies into a tree trunk or is part of a forest or mangrove swamp, taking on a surprising variety of facial expressions. These expressions are subtle, recalling Albert Durer’s exquisite skill in creating facial expression in his engravings. The Nature of Things brings us a host of emotions and attitudes: exhaustion, determination, despair, acceptance, stupidity, censure, ignorance and surrender. The symbolic expression of the human figure in the landscape has become the printmaker’s vocabulary. It is redolent of Sidney Nolan’s Ned Kelly in the bush and Mrs Frazer in the jungle. This human figure is not an expression of outward beauty but derives from the heart and mind. The figure, who may well be the artist from the Huon Valley, a timber worker or all of us, is inextricably joined to surrounding nature in the form of the very Tasmanian theme of forest: its timber, wood, grain and chip. Medium and message are entangled over and over again. Magnificent timbers that give us luxuriant wood grains have always been synonymous with the cultural and natural histories of Tasmania. The prints are hand burnished onto hand made Japanese Kozo paper. Again, the theme of wood and plant; Kozo being a plant [Broussonetia kajinoki] which provides a paper that is used for its softness, sensitivity and absorbency in the traditional art of relief woodblock printing. Woodcutter cuts images of woodcutting. In Tiny Secret 2005, the figure appears to have wood chips for hair and a truncated body composed of wood grain executed with a delicate pattern carved out of the woodblock across the grain that the craftsman has set up as a ground, through which he arranges his forms. The forms are constructed through spatial arrangements consisting of an intricate, patternated relationship between negative and positive space, black, white and grey, varying thicknesses and directions of line. The style Schlitz has developed in each of the images gives excellence to this body of work as they are consistently unique and similar. From a distance the predominant use of horizontally cut texture appears to be a woven textile fabric and could well be translated into such. 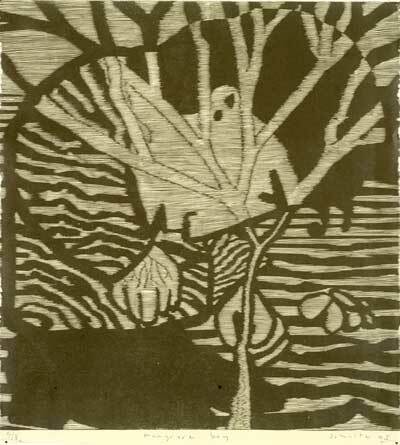 This patterning that constructs the image is, by its very nature, intrinsic to the medium of woodcut printing. Of course, grain pattern is there to be utilised. In this case it is added to when it is taken away, building up exquisitely pleasing compositions: whimsically woven into the themes of forest, timber, tree, bonsai, mangrove, stump, branch, chopped and desecrated. As in Forester 2005, the human head lies face up on what is left of this magnificent species. Has the forester also been exploited and discarded, uncared for and left to waste? Boy in a Giant’s Leg 2005 contains all the elements of Schlitz’s visual repertoire: branching forms both delicate and strong, truncated tree, foot as root, man as boy – immature – or perhaps man as the clumsy toddler making the same mistakes again and again, never learning the lesson. Or so it seems, as human nature exercises power over ecological nature but which will have the last laugh? In Repositoryator 2005 the branching tree form is there again but replaced by the branching tissue that moves air into the lungs; this interchangeable form mirrors the clean, green form of the tree that is personified in the metaphor ‘trees are the lungs of the earth’. There is a darkness lurking in all of these works that speaks of the cultural rift in contemporary Tasmanian society. This darkness which is so appropriately embraced by the medium is played out by a serious sense of humour. No explanation is needed, as with any good art, it is all there to be enjoyed: powerful images for a powerful struggle. Thank you craftsman magician for the visual music arising from your dedication, fervour and expertise. Once again our hearts and souls are warmed. No image on this site may be reproduced in any way without prior permission from the artist.